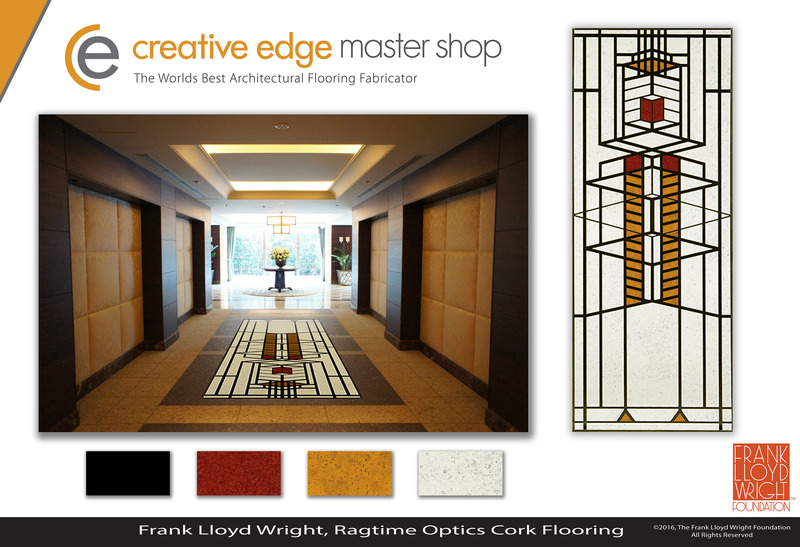 Creative Edge Master Shop, the largest and most experienced fabricator of architectural materials using waterjet technology, has announced a new licensing agreement with the Frank Lloyd Wright Foundation. 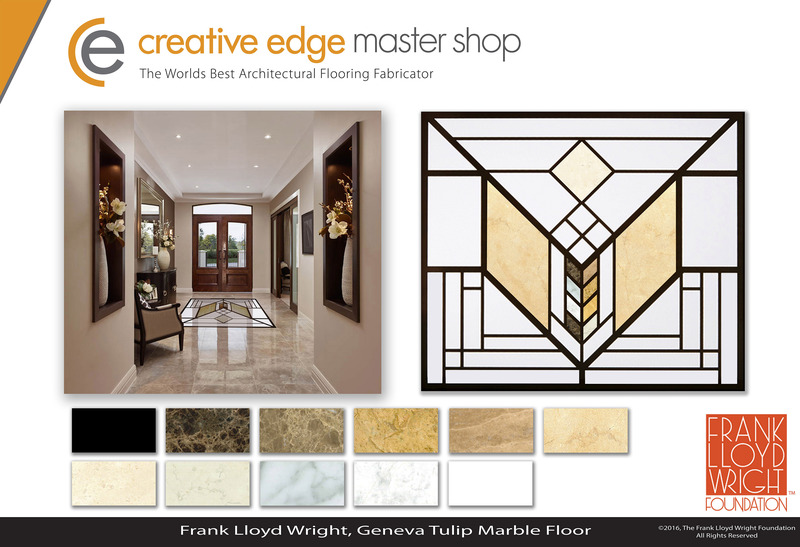 Creative Edge Master Shop, the largest and most experienced fabricator of architectural materials using waterjet technology, has announced a new licensing agreement with the Frank Lloyd Wright Foundation. 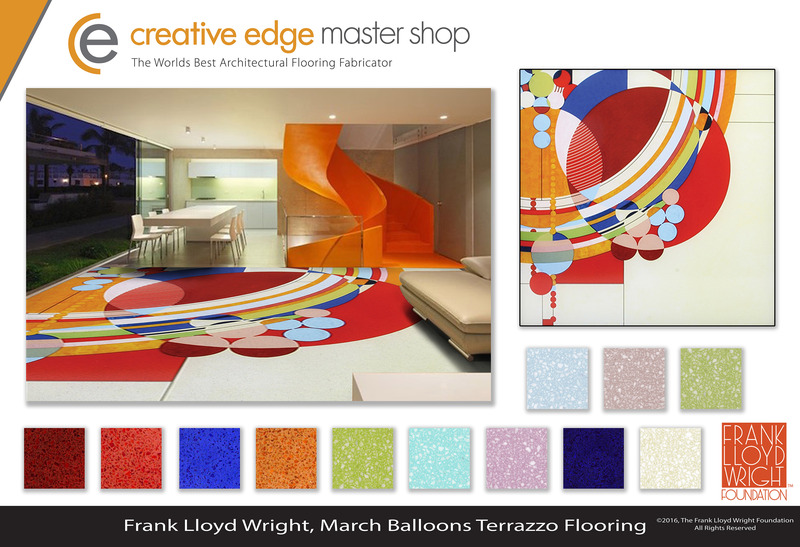 The agreement authorizes Creative Edge to interpret distinctive designs from the Frank Lloyd Wright Foundation’s extensive archives in stone, terrazzo and metal materials for residential and commercial hard surface flooring. The Frank Lloyd Wright Foundation archives contains the world’s most complete collection of materials related to a single artist. Wright’s distinctive architectural designs range from residences executed in the Prairie style of the late 19th century, to modern styles including Fallingwater, the Usonian Homes, and the Solomon R. Guggenheim Museum in New York City in the late 1950s. 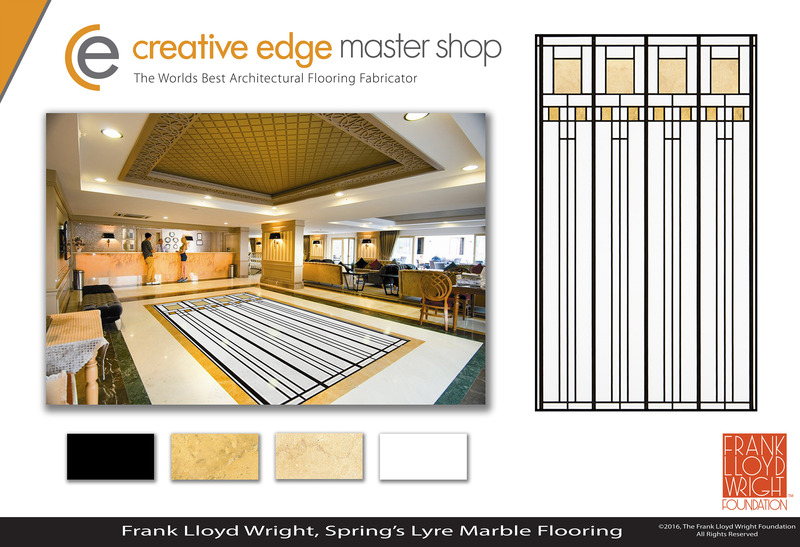 Combining Wright’s designs with Creative Edge’s application of waterjet technology to architectural fabrication adds a new dimension to signature flooring that is executed in the style and characteristic of Wright’s compositions. The FLW Foundation, in keeping with the living legacy of Wright’s work, will approve all fabrication plans and designs. An ancient system once composed of stone chips in a cement matrix, today’s terrazzo replaces cement with epoxy. Creative Edge’s Terrazzo flooring can be fabricated in the factory or poured on site. Wright’s most famous use of terrazzo was The Guggenheim Museum in New York City. The palette of stone available from global sources offers an unlimited set of colors, patterns, and textures. Granite, limestone, marble, slate, and onyx offer natural, organic options design for lobbies, borders, accents, and other design elements. The classical architectural metals such as brass, bronze, steel, stainless steel, and aluminum will figure into the fabrication techniques and can be combined as accents, lines, or features in both terrazzo and stone floors. The FLW Foundation, established by Wright in 1940, along with the owners of various Frank Lloyd Wright building sites, own copyrights that give them exclusivity to duplicate buildings and designs created by the renowned architect, which are protected by copyright and trademark law. To learn more about Creative Edge, visit the Creative Edge Master Shop website, email jimb(at)cec-waterjet.com or call 641.472.8145. 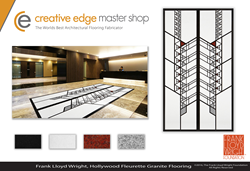 Creative Edge Master Shop is the pioneer and world leader in the application of waterjet technology to architectural fabrication. Under the leadership of Creative Edge President and CEO Jim Belilove since its founding in 1988, the company has completed more than 10,000 projects and introduced the world to the remarkable possibilities of waterjet fabrication for architecture and design. From their headquarters in Fairfield, Iowa, Creative Edge Master Shop has established a wide base of renowned and highly regarded customers. The company has contributed its signature products to a number of landmark architectural projects including O’Hare International Airport, the Astronauts’ Memorial at Kennedy Space Center, the Federal Reserve Bank in Minnesota, the entrance to Disneyworld's Magic Kingdom, Pittsburgh International Airport, Lackland Air Force Base in Texas, The Cosmopolitan Hotel in Las Vegas, shopping centers, airports, hotels, casinos, convention centers and prestigious residences throughout the U.S.